The content of this article provides interesting history, facts and information about life in Ancient Rome and the class of Romans who were called the Plebeians. The Patricians were the ruling class and the Plebeians were a subject class. Following the founding of Rome by Romulus the Roman people consisted only of Patricians and their Clients. The Patricians formed the Populus Romanus, or sovereign people, the elite Romans. Tullus Hostilius, an early ruler of Rome, made war against the Etruscans. The Albans, under their dictator Mettius Fuffetius, followed him to the war as the subjects of Rome. In the battle against the Etruscans, the Alban dictator withdrew to the hills, but when the Etruscans were defeated he descended to the plain, and congratulated the Roman king. Tullus pretended to be deceived. On the following day he summoned the two armies to receive their praises and rewards. The Albans came without arms, and were surrounded by the Roman troops. They then heard their sentence. Their dictator was to be torn in pieces by horses driven opposite ways; their city was to be razed to the ground; and they themselves, with their wives and children, transported to Rome. Tullus assigned to them to live on the Caelian Hill. Some of the noble families of Alba were enrolled among the Roman patricians, but the great majority of the Alban people were not admitted to the privileges of the ruling class. These people were the origin of the Roman Plebs, who were thus quite distinct from the Patricians and their Clients. The Patricians still formed exclusively the Roman people. The Plebs were a subject-class without any share in the government. The Plebeian order was composed of the lowest class of freemen. Those who resided in the city, were called “Plebs urbana;” those who lived in the country, “Plebs rustica.” But the distinction did not consist in name only, the “Plebs rustica.” were the most respectable. The Plebs urbana consisted not only of the poorer mechanics and laborers, but of a multitude of idlers who chiefly subsisted on the public bounty, and whose turbulence was a constant source of of problems to the Roman government. There were leading men among the Plebeians who were kept in pay by the corrupt magistrates in order to influence the 'mob'. 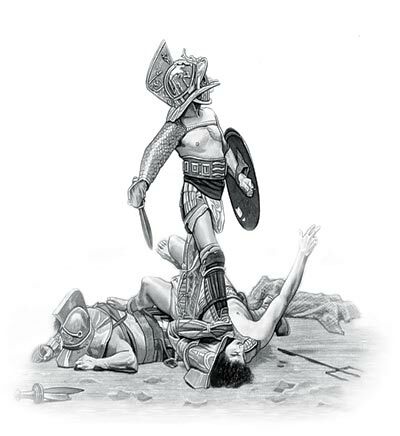 Trade and manufactures were considered as servile employments, the plebs had no encouragement to work; and the numerous spectacles which were exhibited, particularly the shows of gladiators, served to increase their natural ferocity. The Patricians and Plebeians formed two distinct orders in the state. After the banishment of the kings the Patricians retained exclusive possession of political power. The Plebeians, it is true, could vote in the Comitia Centuriata, but, as they were mostly poor, they were outvoted by the Patricians and their clients. The Consuls and other magistrates were taken entirely from the Patricians, who also possessed the exclusive knowledge and administration of the law. In one word, the Patricians were a ruling and the Plebeians a subject class. But this was not all. The Patricians formed not only a separate class, but a separate caste, not marrying with the Plebeians, and worshiping the gods with different religious rites. If a Patrician man married a Plebeian wife, or a Patrician woman a Plebeian husband, the state refused to recognize the marriage, and the offspring was treated as illegitimate. The content of this Plebeians category on life in Ancient Rome provides free educational details, facts and information for reference and research for schools, colleges and homework. Refer to the Colosseum Sitemap for a comprehensive search on interesting different categories containing the history, facts and information about Ancient Rome.